Easy Data Recovery for Mac performs seamless scan to recover mac data from HFS & HFS+ Partition. For more safety, Mac Data Recovery uses read-only access to handle the drive or memory support you are about to recover lost data. * Easy Data Recovery for Mac supports to recover lost, deleted and formatted partitions or logical HFS, HFS+ volumes. 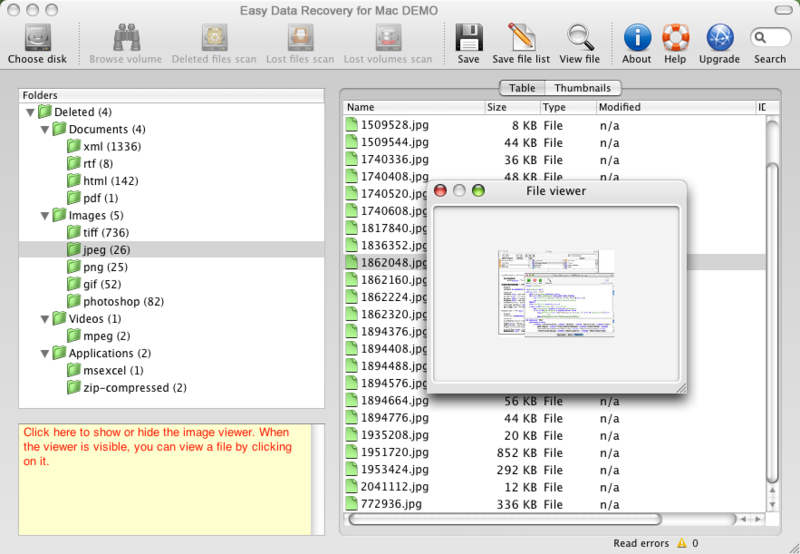 * Easy Data Recovery for Mac supports recover file system components. * Recover & restore lost data from missing or lost files & folders. * Supports all file types. * Simple and advanced drive recovery scans. * A read-only utility that does not damage your data on the drive in any way. * Supports data recovery from FireWire and USB 2.0 Disk Drives. Qweas is providing links to Easy Data Recovery for Mac 2.0 as a courtesy, and makes no representations regarding Easy Data Recovery for Mac or any other applications or any information related thereto. Any questions, complaints or claims regarding this application Easy Data Recovery for Mac 2.0 must be directed to the appropriate software vendor. You may click the publisher link of Easy Data Recovery for Mac on the top of this page to get more details about the vendor.